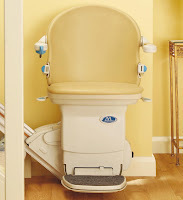 Castle Comfort Stairlifts offers top brand stairlifts, keen prices and fast installs for all those seeking stairlifts in Durham. And all work comes with our no-quibble guarantees and famous customer service satisfaction. 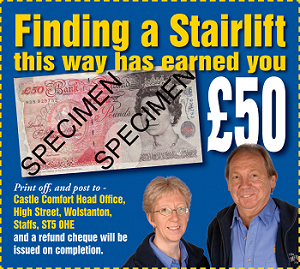 Give us a call today on 0191 644 0366 for Stairlifts throughout the North East. Another local authority is being forced to consider asking 1,700 people with stairlifts fitted via their funding system to pay ten pounds per week for maintenance. Durham County Council blames government spending cuts for needing to slash over 123m pounds from its spending over the next four years. Most chairlift installations currently have a warranty of between one and five years depending on what was negotiated with the supplier, and Durham council is looking at passing ownership of the stairlift to the user when the warranties, which include 24 hour emergency call out cover, run out. Alan Hardwick, of Stockton on Tees, who suffers from spinal problems, has had a council stairlift for the past 15 years. The 69-year-old is angry at what he feels is another erosion of his income. He said: "The council has sent out a letter saying it is reviewing the funding and the maintenance for stairlifts. "The council says we will have to pay for the stairlifts and I'm not happy about that at all. "If this is approved it will mean the council is chipping away at my pension, but it says it's a question of funding. "I can't see how they are going to save that much from this as they only come out for 20 minutes each year to check them if nothing goes wrong with them."